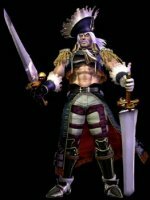 Cervantes de Leon (セルバンテス・デ・レオン, Serubantesu de Reon) made his first appearance in Soul Edge and has returned in Soulcalibur, Soulcalibur II, Soulcalibur III and Soulcalibur IV, and appears in all of those games as an unlockable character. 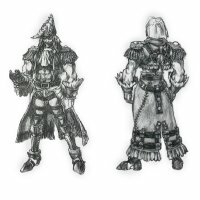 Cervantes' nickname in Soul Edge and Soulcalibur is "The Immortal Pirate". Story-wise he's also known as "The Dread Pirate". Cervantes' father, Phillip, was a privateer on a special mission from the Spanish King to loot in the name of Spain. One day, he got close to an English ship under the intent of looting it, only to find that it was a warship. Phillip Leon was taken by surprise, his ship was destroyed. He died along with it. Cervantes was devastated. He decided that if that was what happened to sailors that swear allegiance to Spain, he would forsake it. He would become a pirate. One day, he received a message from the "Merchant of Death," Vercci. 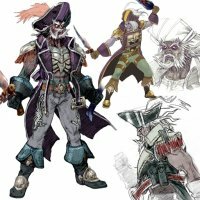 Cervantes grew up with pride for his father, who was a great seaman, but became a pirate after his father died in battle. 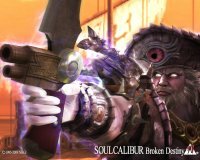 He obtained Soul Edge, and it eventually drove him insane as it devoured his soul. 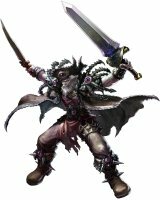 His insanity caused him to kill anyone who came looking for Soul Edge. 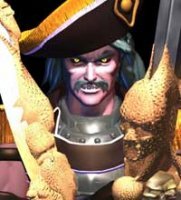 Cervantes' reign of terror lasted for over 20 years, until Sophitia, Taki, and Siegfried defeated him. But this was not the end for Cervantes. 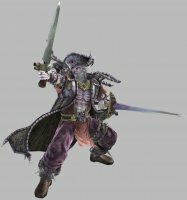 Nightmare, the new host for Soul Edge, unknowingly resurrected him using the fragments of Soul Edge that were still inside of Cervantes. Now, Cervantes seeks the demonic blade with renewed fever and strength. 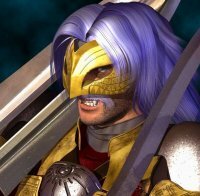 Cervantes' memories had come back, along with the desire to search for Soul Edge again. He remembered how it had robbed him of his free will, but that made no difference. 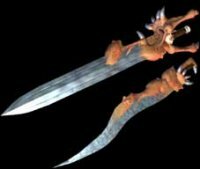 During Cervantes' search for Soul Edge, he realized that the second sword had been shattered as well. Cervantes found a few new pieces and pondered over them. Was this the end? Just then, two pieces of the sword began to resonate and melt into one... Four years passed, with Cervantes stealing souls and collecting fragments. Eventually, they took the form of a sword. 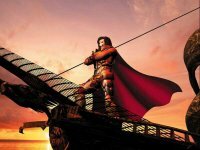 Cervantes' goal was to regain Soul Edge, and to do that, he needed as many of the fragments as he could find. 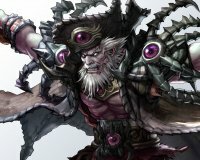 By making use of the fragments of Soul Edge in his body, Cervantes managed to keep his sanity. 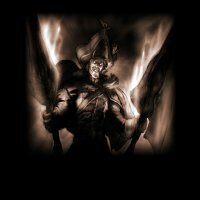 Using Soul Edge and the Adrian, he devoured the souls of the brawny men of the sea. One day, when he had moored his ship in an opening in the cliffs in order to avoid the stormy waves, the presence of the "other" Soul Edge that he had felt up until this time disappeared. Then, his body began to crumble! The fragments of the cursed sword inside his body were losing power. At this rate, the would return to the form of a charred corpse. "Wow, looks like you're in trouble!" Turning to the source of the sudden voice, Cervantes saw a girl in green and a flock of black birds at the top of the mast. "Who the hell are you?" "I guess you could say I'm the servant of the cursed sword." Cervantes grew angry at the overly cheerful girl. However, listening to her words, he learned that the sword had been sealed by an equal and opposite power. After the girl disappeared into the darkness, Cervantes thought to himself. 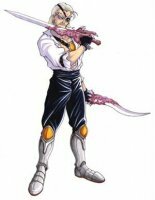 He had no intentions of binding himself to a shared objective with the girl, but he had no choice but to maintain his life by absorbing new souls, and while doing so, destroy the enemy of Soul Edge and revive the cursed sword that had been sealed. His obsession for souls flaring, Cervantes set out into the stormy sea. 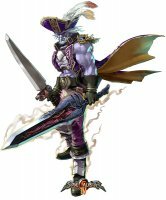 Once there was a dread pirate who, upon claiming Soul Edge, became a creature of pure malevolence. Though defeated once, he managed to return to live through the intervention of the cursed sword's fragments. 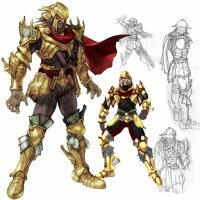 He gathered more and more fragments until he had enough to form one great weapon, formidable enough to be called a second Soul Edge. 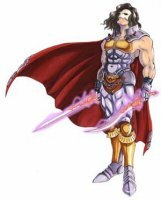 But one possibility had eluded him; the spirit sword, Soul Calibur, appeared and sealed Soul Edge's power away! Needless to say, his own body did not escape unscathed. Cervantes realized his flesh could decay at any moment. He had no time to lose; this spirit sword must be buried once and for all! As Cervantes' body failed, he sought souls in vast numbers to hold it together. 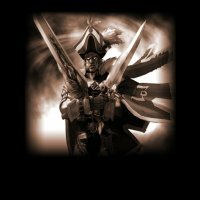 The souls he absorbed becamse an army in his service, and he soon found himself once again a mighty pirate in command of an undead armada. He even went so far as to attack his own daughter, Ivy; and by feasting on her soul, rich and ripe, he gained tremendous power. But calamity struck again. An evil wave swept across the world. The cursed sword had freed itself from the spirit sword and regained it's full power! 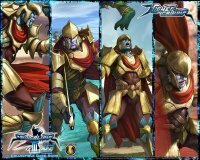 His own Soul Edge responded in turn, and tried to pull away from him and treturn to it's other half. After a brief deliberation, Cervantes decided to let it go. Once the cursed sword was whole, he would seize it for his own. 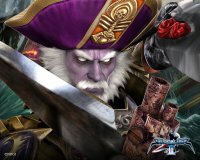 To replace his lost blade, Cervantes chose a sword that was an old friend. But no sooner had he clutched the longsword's hilt than it became a cursed weapon. Such raw, overwhelming power! Now no one could stop him. 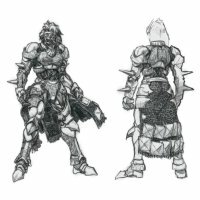 "Wait and see, Soul Edge, I'll be the one to claim you, and all the world with you! 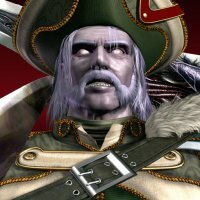 Cervantes traveled to Ostrheinsburg in order to reclaim Soul Edge and devour the sweet soul of his daughter, Ivy, but it was Ivy herself who foiled his plan. 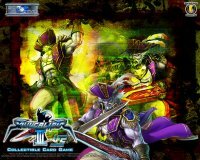 His body beaten and his mind shattered, Cervantes was swallowed by a dimensional rift opened by Soul Edge. years later, as the 17th century dawned, strange rumors began to stir among the men of the sea. They spoke of a giant ship with a skull on its bow, captained by the legendary Cervantes. No one truly believed it, of course - more than half the century had passed since the great pirate stalked the Atlantic. 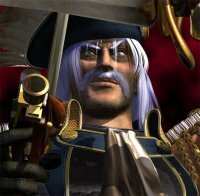 What they didn't know - what they couldn't have known - was that Cervantes had broken free from Soul Edge's control, and escaped from the other dimension. He had returned to his world at the height of his powers. 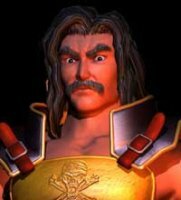 "I'll make damn sure those fools remember the name of Cervantes, Lord of the Seven Seas!"